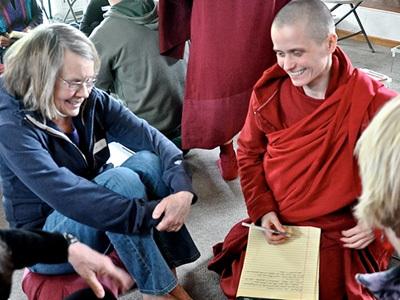 To review a little, we’ve been talking about the ways to generate bodhicitta: the altruistic intention to become a Buddha for the benefit of all beings. There are two principal ways: one way is called the Seven-Point Instruction of Cause and Effect, the other is called Equalizing and Exchanging Self and Others. Before we do either of these, we meditate on equanimity, which is equalizing friend, enemy and stranger; and seeing that the relationships are very changeable and that our mind makes people into friends, enemies and strangers. It’s not that they are a nice person or a rotten person by themselves, but we judge and evaluate them in terms of “Me,” the center of the universe, and then they become a friend, enemy or stranger. In fact, those relationships change. When we meditate deeply on that we begin to have a sense of equality among people in terms of our respect for them as living beings and our concern for their wellbeing. We stop playing favorites, that’s basically it. This is the beginning. Then we enter into the seven points of cause and effect. In order to generate bodhicitta—the seventh point, which is the effect—we need to have a great resolve in wishing to benefit sentient beings and lead them on the path. That’s the great resolve—the sixth point. To have this resolve, we need to have compassion, wanting beings to be free of suffering—the fifth point. To be compassionate we have to see beings as lovable first—that’s the fourth point, heart-warming love. The technique to generate this feeling of heart-warming love is to recognize sentient beings as our mothers, to know that they’ve all been our mothers. This is the first of the seven points. Reflect on their kindness when they were our mothers—this is the second point. From that naturally arises a wish to repay them, which is the third point. This leads to the heart-warming love and compassion and the great resolve and bodhicitta. Previously, we have talked about equanimity and we’ve talked how beings have been our mothers in previous lives even though we don’t all remember it or recognize them as having been so. We’ve talked about the kindness that they’ve shown us as our parents, using the example of our present parents, and really dealing with some of our issues that we may have about our own family in this life, or thinking about whoever took care of us and was kind to us when we were little. We can also use that person rather than our actual parents if we prefer. Then, generating the third point, the wish to repay that kindness which comes automatically when others have been kind us, we recognize that kindness and a wish to help them in return just automatically arises. Love is the wish for somebody to have happiness and its causes. Compassion is the wish for them to be free of suffering and its causes. Love can be directed towards any particular individual and so can compassion. In terms of just generating love and compassion in general, there’s no particular order. In fact, sometimes we have compassion for somebody first because we see them suffering and then later on we have love for them and want them to have happiness. So there is no particular order with love and compassion. When we’re talking about heart-warming love, it is not just general love because general love is wishing a particular person to have happiness and its causes. We already have some love, don’t we? It’s just that our love now is very partial and it isn’t generated towards all living beings, is it? We have some love now, we have some compassion now, but it’s not what we would call great love or great compassion. It’s also not what we would call heart-warming love because heart-warming love is something that’s felt towards all beings, not just toward a few people that we’re fond of. Heart-warming love sees other beings in beauty and that they’re equal to us in wanting happiness and not wanting to suffer. Heart-warming love sees other beings in beauty. You can see why the meditation on equanimity is important. Why seeing others as our mother, remembering their kindness, and wishing to repay it are important. To see sentient beings as lovable, we have to see them as kind and we have to see ourselves as related to them. We have to see that they’re equal in wanting happiness and not wanting suffering—equal in their relationships to us. We can’t just jump in with some kind of intellectual or idealistic goodwill and say, “I love everybody!” That’s what we do when we write Christmas cards and when we were children in grade school! We saw how long that lasts because it’s only an intellectual love. As soon as the other kid tattled behind our back, we didn’t love them anymore. Or as soon as the grown-up tattled behind our back when we’re grownups we don’t love them anymore, do we? We thought we outgrew childhood. We just developed a different vocabulary for that! People don’t “Tattle behind our backs” when they are adults; they just say, “Untrue malicious stuff” to ruin our reputation, right? Same thing as tattling, but we make it sound more sophisticated. We have to be able to see beings as lovable and be able to overlook some of their defects and the possible harm that they’ve given us in order to generate heart-warming love. Our mind is very accustomed to seeing people’s faults. We’re super sensitive and we note down every single tiniest harm they possibly could have given us and we’re very easily offended. They didn’t respect me and asked me to do this. They didn’t respect me and told me to do that. They didn’t honor me and recognize my good work. They didn’t say thank you. They didn’t say you’re welcome and they don’t appreciate how much I did. We’re so willing to be offended at the slightest little twist of anything; we’re always looking out for how people mistreat us and how they don’t appreciate us. And so on and so forth. That kind of mind pays attention to the slight injustices that we’ve dreamed up. Most of the injustices on the part of other beings, by and large, are unintentional and don’t mean us any harm, but we make it into harm! In addition, even when they maybe did have had some kind of harmful intent because they were confused and suffering we note those things in stone! We remember those situations especially with the people we’re closest to so that the next time we have an argument we have some ammunition to use against them. We kind of gloss over it, but next time there is a fight: “Well, remember five months ago on January 19 at 7:30 you said this and that to me,” and we don’t let it go. That kind of habit of mind in which we’re always seeing sentient beings as blameworthy and defective—that habit, that judgmental mind, is a big impediment on the path and it’s the total opposite of this heart-warming love. That’s why we spend so much time thinking that other beings have been our parents and remembering their kindness—how they gave us this body, how they took care of us, how they taught us to tie our shoes and brush our teeth, how they gave us an education and how they put up with us when we were such bratty kids, they put up with us when we were teenagers and even worse! How they put up with us as adults when we still didn’t move out of the house, or when we still were bringing our dirty laundry home for them to do. How we neglected them at this point or that point, or expected them to do this or that for us. Really think about everything our parents have done for us, what they have put up with and how they’ve continued to give us love and support. It’s very touching. When we think that all living beings have been like that to us, we naturally wish to repay that and begin to see other living beings in beauty. Instead of paying attention to the few times we had difficulties with other beings, we pay attention to all the tremendous benefit that we’ve received from them. It’s very, very important. It is the same kind of thing as appreciating what our spiritual teachers have done for us instead of always picking at their faults. It’s like anything in life, we can look at its good qualities or we can look at what we don’t like. Depending on what we focus upon influences our feelings. That’s why it’s important to change what we focus on and develop a mind that looks for the good qualities and looks for the good in situations. It’s like seeing the glass half empty and the glass half full. We don’t realize that we would see that the glass is not just half full, it’s very full, if we just stop looking at the half empty part. I really see this with the prisoners that I work with. The guys I work with just have so much love for their parents, especially their mothers. They’ve usually had pretty rotten upbringings, often abused and neglected as children. But they love their mothers dearly because even though as children they may have acted in a very negligent or criminal ways, their mother has always hung by them, has always been there. No matter what they’ve done their mother has always been there. They have this very deep regard for their mother. When they are in prison, they really stop looking at the harm or what their mother hasn’t done for them. They don’t say, “My mother hasn’t visited in five months.” Instead they say, “My mother visited me last month.” Even though she hadn’t visited in five months they don’t get bummed out about that; they just feel so happy that she did visit. Instead of looking at what their mother didn’t do, they look at what their mother did do. Then the warmth comes up. This is also how we are trying to train our minds to look at all living beings—really cultivating an attitude that sees them in beauty, sees them in kindness and sees them as having good qualities. We do this very easily for our friends but this easily becomes attachment, doesn’t it? With attachment, we want our friends to be happy and be free of suffering because they are nice to us, or because they’re related to us, or because they stick up for us, or because they give us presents. They boost us up when we’re down and they do this and that for us: that’s attachment. We can see very clearly that as soon as the person stops doing those things, our feeling of fondness towards them changes. The benefit of seeing that they’ve been our parents in previous lives and remembering their kindness is that the feeling of wanting to repay that kindness doesn’t change when their behavior in this life changes. How they treated us and what they did for us in previous lives as our parents still remains. We all know that sometimes relationships go through difficult points. If we remember the kindness of the person we can still have that sense of fondness and connection with them and we don’t just boot them out of the realm of who we care for simply because of what’s happening right now, what they did or didn’t do right now. This is something that’s very practical. We have a little bit of work to do with our relationships, don’t we? One of the big things we need to do is to begin to let go of grudges and all the things we’ve stockpiled from the past. All the wrongs that people have done us and how hurt we feel. We need to let go of the negative impressions that we have towards certain people and remember that these people have been our parents in a previous life. They changed our diaper, they fed us and they gave birth to us in this very unconditional way that parents help their children. We need to remember that no matter what they’ve done in this lifetime we’ve had this tremendously deep connection with them in the past. We were totally dependent on them and they came through for us, because we lived. So there is some basis of trust and goodwill. That doesn’t mean we have to trust that person the same way in this life, or act the same way towards them in this life. We act according to different roles and things, different situations. Yet, in our heart we can still have that same feeling of connection and goodwill towards them. For me, this has been very healing. I remember a while back when there were some really difficult things going on with someone, some very painful things being said, and my mind felt totally “blah” toward this person. I wondered how I was ever going to deal with them. I started meditating that they were my parent in a past life and they used to hold me when I was a baby, feed me, teach me to talk and so on. When I saw that this person was more than what that present relationship was, and that there had been this kind of tenderness and gentleness before, it began to change the whole way I looked at them this life. I began to see that who they are this life, or how my present relationship was with them, was just a very fleeting experience, a very fleeting appearance that was dependent on the conditions in this life. In the past, there was this whole other way of relating to them and that, in the future, there was this possibility of being close and being affectionate. So at least from my heart, my side, I should not continue holding a grudge against them and, instead, have a sense of goodwill knowing that the relationship could change. This is where metta meditation comes in. Metta in Pali, or maitri in Sanskrit, means love. The name of the future Buddha, Maitreya, means “great love.” When we do the metta meditation, which is popular in both in the Theravada and the Mahayana traditions, we are wishing ourselves and others to be well and happy. Often, in the traditional way of teaching it, we start out with ourselves and try to love ourselves. Some Westerners have great difficulty with this. We do not have a lot of self-love but I think it is good to cultivate this. Self-love is very different from self-indulgence. We often engage in self-indulgence when we don’t love ourselves and it doesn’t really make us happy. Self-love is where we actually do care about our own welfare. Actually, this happens when we want to get out of cyclic existence because we care about ourselves and want ourselves to be happy and free of suffering. When starting with metta meditation it is good to start with ourselves. Not just saying mechanically, “May I be well and happy,” but to really in our heart wish ourselves to be happy. You might start out with simple ways of wishing ourselves to be happy. May I have good relationships, may I have enough food, may I have good health—this kind of thing, things of this life that make us happy. Sometimes be a little bit careful about what you wish for. As they say, you might get it! If you’re wishing for a promotion, then you might get the honor of having to work twelve hours a day instead of eight! Is it really that you want that promotion, is that really what you’re looking for? Or is what you’re looking for a sense of self-confidence and well-being? This might be symbolized by the promotion, but it’s not really the promotion. Really start to ask yourself, what is the happiness that you really want? If you start wishing for a gorgeous huge house in the suburbs is that really going to make you happy or is it more that you’re looking for security? Are you looking, again, for a sense of self-respect because if you have a beautiful house others will like you and respect you more? What is it that you are really looking for? I think this is very important that we ask ourselves this. If we don’t, we might wish ourselves to have things then get them and find out we have more problems. Really ask yourself, what is it? If I’m wanting more self-confidence, is getting the promotion the thing that’s going to do it? What is the real way to develop more self-confidence? If I’m wanting security, what is the way to do it? Is having a big bank account really going to make me secure? Doesn’t having financial security mean a change of mind rather than a change of numbers in our bank account? If I’m looking for security in my relationships is that possible by being possessive of somebody else and being jealous of them? What’s going to bring about a feeling of security in my relationships? Again, isn’t it a sense of trust and well-being in myself and an ability to ride through ups and downs that [which] will actually free me from being possessive and jealous of the other person? When we’re doing this meditation on love, in which the ultimate aim is to focus on others, we have to start with ourselves. Really start asking yourselves what is the happiness you want? Sometimes we don’t have a very good idea of what it is we actually want and for that reason we use the wrong methods to get it and we feel continually discontent. What we might come to, and I’m not jumping to this as a conclusion because you have to do this work yourself, but what we might get to when wishing ourselves happiness is wishing ourselves to be free of ignorance, anger, and attachment. We might start wishing ourselves to be more forgiving or wishing ourselves to be more joyful at other people’s well-being and being less jealous, or whatever it is. Really spend some time thinking about this and then really wishing ourselves to be happy in that way. Imagine yourself being happy in that way. Imagine yourself being more confident. Being more confident doesn’t mean that you act arrogant. Acting arrogant and being confident are two entirely different things. You might imagine yourself feeling more secure or whatever it is. Feeling more talented, feeling more loved, whatever it is, imagine yourself having those feelings and wishing yourself well in that regard. Start off with yourself when you do the metta meditation. Then, start to spread it to other people. It’s easy to spread it to our friends. I don’t think we need to spend a lot of time wishing our friends to be well and happy. Again, it’s interesting to start to think about your dear ones, your family, your friends, and to wish them happiness. Are you really wishing that your kid has a new bicycle? Are you really wishing that your kid graduates Phi Beta Kappa from Yale? Is that really what you wish for your children? Do you wish that your child will become everything you weren’t able to become? Maybe they aren’t going to be happy being that. What is it you really wish for your child? What is it that will really make your friend or your spouse or your boss or whoever it is happy? Here again, when you get looking you start looking deeper into what happiness really means. We know our loved ones very well and we may even say, “May they be free of their self-loathing,” because we can see how much they suffer from that. May all of their inner beauty come out. May they trust themselves. Look on a deeper level to see what happiness is really about instead of wishing that they will be rich and famous, this kind of stuff. We all say, “I’m not so crass, I don’t want them to be rich and famous!” but if we look, we all want to be rich in our own little circle, we all want to be famous in our own little circle. We may not all want to be Arnold Schwarzenegger but we still have this wish for fame and richness in our own little way. Start to free yourself from that and really understand what happiness is all about. We start with ourselves, we spread it to friends, and then we spread it to strangers. You start thinking about different people who are strangers. You might start with different people in the room here that you’ve never met before, that you don’t know or whose name you don’t know. Try and think what their life is about and wish them well. Think about their basic human needs and wish that they may have those. Think of people in Iraq or people in Uganda, or people in the inner city, or somebody you see in the car next to you in the traffic jam, or the people around you in the grocery store, or at the airport or where ever you are and really wish them to have happiness. Again, look deeper into what happiness is and wish that for them. This takes a little bit more effort but if we’ve done the equanimity meditation before and if we’ve already meditated [and see that] these people have been our parents and have been kind, then we feel a relationship to them, even though we don’t know them in this life, it becomes easier to generate love for them. From the stranger we go on to the people that we don’t get along with, the people that we are afraid of, who we feel threatened by, those who we consider vile or immoral or treacherous. The people who have harmed us or harmed the ones that we care about—wish them love. Generate love, wish them happiness. This might be a little bit difficult because our society teaches us to hate those people. But I think that hating the people who have harmed us is shooting ourselves in the foot. If we inflict harm on the people who have harmed us are they going to be nice to us in return? No. It doesn’t work that way. We don’t bomb Iraq so that the Iraqis are going to like us. Look what’s happened. In our personal relationships it’s the exact the same thing. We don’t beat somebody up until they decide to like us. So you can see that when we inflict harm on the people who have harmed us we are creating the causes for more immediate suffering for ourselves. They are going to retaliate and we are creating all sorts of negative karma, which is going to bring us more suffering in future lives. If you act spitefully toward your ex-husband or your ex-wife to get back at them for what they did, they are not going to be nice to you and you’re going to be unhappy. I think the way to handle this is really to generate a sense of love and think, “Wouldn’t it be nice if they were happy?” Think about what it is that they’re suffering from now that’s making them so unhappy, what’s making them do what you find objectionable and harmful. What are they suffering from? If somebody is talking bad about you behind your back, what is it that they’re suffering from? Maybe they’re suffering from jealousy or insecurity or feeling like they need to control everybody, which is insecurity isn’t it? May they feel secure, may they be able to rejoice in their own accomplishments without comparing themselves to others. May they have a happy heart and see goodness around them. May they not have a sense of lack but a sense of plenty in their lives. Wouldn’t it be wonderful if these people did have happiness – the mental happiness that they want and have the physical things that they need? Wouldn’t it be nice if the militants had more self-respect? Wouldn’t it be wonderful if they were able to practice the teachings of their own faith in a more realistic way according to the actual teachings that are in their scriptures? Wouldn’t it be nice if they were able to have a kind heart toward others? Wouldn’t it be nice if the social structure were different so that they weren’t oppressed? Wouldn’t it be nice if their countries were treated with respect by other nations instead of bossed around? Really wishing them to be free of whatever suffering they have and to have whatever happiness they need. We can see that if we wish this for them our animosity changes. It disappears and we stop being afraid of them. Secondly, how we act towards them is going to change and so how they act towards us is going to change in return. We’ve been talking so far about happiness in a worldly way, in terms of having enough food or clothing and shelter and friends, but inside themselves may they have certain qualities. When we are wishing them happiness we are also wishing that they have the happiness of liberation and enlightenment. May they not die a horrible death under the influence of ignorance and karma. May they not be reborn in the lower realms. May they realize emptiness and be free of cyclic existence. May they generate bodhicitta and have the total happiness of an open heart that works for the benefit of others spontaneously. May they have the bliss of Buddhahood. It is important to wish this for ourselves, for our friends, for strangers and for people that we don’t like. This is a very potent meditation to do. It’s very good to do it thinking of individuals, not just generalities of categories. When we’re thinking of yourselves we always think of ourselves as individuals, don’t we? When you start with your friends, imagine certain friends sitting in front of you. When you do it for strangers, imagine the guy who fills up your gas tank, or the teller at the bank, or the person who answered the phone when you made your airline reservation, or the person who set up the website so that you could do it online. Imagine them right in front of you and do that meditation. Imagine different individuals, different strangers so you make a really personal connection and don’t just make it some abstract thing of strangers. Do the same thing when you think of people that you don’t get on with. Think of individuals. We can do that fairly easily in terms of personal harm and we may also see that we are prejudiced against groups of people. Try to imagine individual members from those groups of people sitting in front of you and imagine in your meditation that you look at them and you say to them, “May you have happiness, may you have enough food and shelter, may you feel secure and safe, may your culture expand and show its beauty to the world. May you be free of cyclic existence.” It can be very effective when you do this meditation and imagine individuals in front [of you.] Don’t just imagine feeling this for them but imagine speaking it and saying it. At first we feel so shy even imagining that. How could I say to somebody like this that I really wish them well? It’s important for us to get over our shyness at expressing our positive feelings and be able not only to feel them but also to express them. Sometimes we even have a hard time telling the people we love that we love them, don’t we? We’re so shy about it. It’s important not just to use a lot of words, but to also show it in our behavior. Not to be so afraid of affectionate feelings. Imagine that the little flies that may be flying around in the gompa used to be our mothers in a previous life. Think of that, especially if your mother has already passed away, or your father has already passed away, or somebody dear to you has passed away. You don’t know what they’ve been reborn as. Instead of saying, “Oh, these flies are such nuisances! They’re always bothering me while I’m trying to meditate or drinking my water.” Just wish them well. Wow, here’s some sentient being that got reborn in the fly’s body, what a rebirth! I don’t want that kind of rebirth. I don’t want to wish that on somebody else. May these flies be free of suffering. It may seem strange, but they’re living beings, aren’t they? They want to be happy just like we do. Think about it, those flies want to eat just like we do. They want to feel secure just like we do. We don’t want some stranger coming up and punching us; the fly doesn’t want some stranger coming up and swatting them either! We have to learn to switch our places and not just look at life through just this tiny periscope of “me.” Look at it through the side of the fly. That fly didn’t choose to get reborn as a fly. It wants to be happy. It’s difficult for it now. Wouldn’t it be wonderful if those flies had precious human rebirths in their future lives? Wouldn’t that be wonderful? Instead of being here in a fly’s body, maybe they come in here in a human body so they could understand? Wouldn’t that be wonderful? Wouldn’t it be wonderful if they could learn the Dharma and free their minds from ignorance, anger and attachment? They have the Buddha potential. They have the clear light nature of the mind the same as us, there’s absolutely no difference. It’s not like our Buddha potential is higher than theirs or greater than theirs—it’s the same. Wouldn’t it be wonderful if they were able to actualize their Buddha potential? Think about it and try to expand your heart not just to human beings, but to other realms of existence, to flies and to all the other living beings. If you really practice this, you begin to change. Your mind begins to change. When I was in Madison, I was staying at the house of another nun who had a cat who was very frisky. I came upstairs one morning to make my tea and I wasn’t sure if it was a real mouse or one of her toys that was lying on the floor, until it jumped! Then I realized that the cat had gotten to the mouse and this mouse was totally freaked out about the whole thing. This was a cute little mouse and my friend didn’t wish him to live in a house. But he was inside the house and the cat caught him. We wound up putting him in a box to keep him away from the cat and took him to teachings. We thought for sure he was going to die and that he was fatally injured. We thought it would be very good for him to have some exposure to the Dharma before he died. We took him to teachings in this little box and one of the other nuns who lived across the street took him home. She was so cute, she had some cotton so she made a pile of cotton that was his bedroom and there was another corner of the box that was the kitchen where she fed him. She made a little home for him and he lived in the box for a while, until he escaped from the box. Then they found that he had drowned in a bucket a little while later. The karma of this poor mouse! But at least, in the meantime, we were taking care of him and he learned to be well and happy. Do you think an injured mouse doesn’t want to be happy? Same thing if we get hit by something—we would want somebody to take care of us, wouldn’t we? So we took care of him and he heard some teachings, he heard lots of prayers and mantras, and we dedicated merit for him after he died. We’ve got to expand our notion of what is valuable and not just think about me or just about things that are like me—in other words, our friends or human beings. Really extend it to animals and the other realms of existence. This is a way to train our mind, to re-habituate our mind with a new way of thinking. If you do this, you can’t possibly go into a restaurant where they serve live seafood and say, “I want to eat that live lobster.” You lose your appetite for doing that. Meditation on love is very potent because when we meditate on love our own heart is totally open and when we think about what love is it makes us fearless. When we have fear it’s because we feel alienated, far away and distrustful of others. When our mind focuses on love and we are seeing the good qualities in others we aren’t focusing on how they can harm us and how distrustful, suspicious or fearful we are. We actually feel much more confident in relationship to others because we have this sense of care and affection. We relate to them in a totally different way. Think about it. They often say that when somebody is committing a crime, the one thing that they feed off of is the sense of fear in the victim. If you can turn around and extend goodwill to somebody or even extend friendship, even extend respect as a human being, that can completely switch the situation around. Lots of times what people are really wanting is basic human respect or acknowledgment. That’s why there’s this story of the Buddha and one of his cousins Devadatta. Devadatta was very jealous of him and was always trying to kill him. One time, Devadatta released a mad elephant that went charging towards the Buddha. The Buddha sat there and did this very same meditation on love. By the time the elephant got to the Buddha, the aura of the Buddha’s love and caring concern tamed the elephant who wound up bowing down. That’s why you see it in some pictures—the elephant prostrating to the Buddha. I’m not sure who taught the elephant how to prostrate and I’m not sure that we need to take that literally, but it’s showing that when we have love we are without fear. When we lack fear that changes the whole situation. So that’s the fourth one.